Oppositional Defiant Disorder is the most common psychiatrically diagnosed behavioral disorder in kids that usually persists into adulthood. Kids with OPPOSITIONAL DEFIANT DISORDER are often easily annoyed and deliberately annoying to other people. They repeatedly lose their temper, argue with adults, refuse to comply with rules and directions, and blame others for their mistakes. Stubbornness and testing limits are common, even in early childhood. They are often touchy, angry and resentful; spiteful and vindictive; speak harshly and unkind when upset, seek revenge and have frequent temper tantrums. They are manipulative and often induce discord in those around them. The primary behavioral difficulty however is their consistent pattern of refusing to follow the commands or requests by adults. Symptoms of OPPOSITIONAL DEFIANT DISORDER are usually seen in multiple settings, but may be more noticeable at home or at school. All kids display most of these behaviors from time to time and oppositional behavior is often a normal part of development for the two to three year old and early adolescent. However, kids with OPPOSITIONAL DEFIANT DISORDER display these behaviors more frequently and over a long period of time (i.e. six months or more) and to the extent that these behaviors interfere with learning, school adjustment and sometimes social relationships. Five to 15% percent of all school-age kids have OPPOSITIONAL DEFIANT DISORDER. In younger kids it is more common in boys than girls, but as they grow older, the rate is the same in males and females. Some kids with OPPOSITIONAL DEFIANT DISORDER may go on to develop the more serious Conduct Disorder (CD) which is characterized by aggressive, criminal and violent behaviors. Thus, OPPOSITIONAL DEFIANT DISORDER is sometimes a precursor of Conduct Disorder. And, although much of the literature tends to lump ODD and CD together, they seem to be distinct entities. Conduct disorder has a genetic component, OPPOSITIONAL DEFIANT DISORDER does not. The causes of OPPOSITIONAL DEFIANT DISORDER are unknown, but biological and environmental factors may have a role. The quality of the youngster's family life in particular seems to be an important factor in the development of OPPOSITIONAL DEFIANT DISORDER. Some studies have found that certain environmental factors in the family increase the risk of disruptive behavior disorders including: poor parenting skills, domestic violence, physical abuse, sexual abuse, neglect, poverty and substance abuse by parents or caregivers. Some students develop OPPOSITIONAL DEFIANT DISORDER as a result of stress and frustration from divorce, death or loss of a family member. OPPOSITIONAL DEFIANT DISORDER may also be a way of dealing with depression or the result of inconsistent rules and behavior standards. A youngster showing symptoms of OPPOSITIONAL DEFIANT DISORDER should have a comprehensive evaluation because the diagnosis of OPPOSITIONAL DEFIANT DISORDER is not always straight forward. Therefore it needs to be made by a psychiatrist or some other qualified mental health professional after a comprehensive evaluation. The youngster must be evaluated for other disorders as well since OPPOSITIONAL DEFIANT DISORDER usually does not exist alone. OPPOSITIONAL DEFIANT DISORDER commonly occurs in conjunction with anxiety disorders and depressive disorders. Fifty to sixty-five percent of kids with OPPOSITIONAL DEFIANT DISORDER have ADHD, 35% develop some form of affective disorder, 20% have some form of mood disorder such as depression or anxiety and 15% develop some form of personality disorder. If the youngster has ADHD, mood disorders, or anxiety disorders, these other problems must be addressed before you can begin to work with the Oppositional Defiant Disorder component. It will be difficult to improve the symptoms of OPPOSITIONAL DEFIANT DISORDER without treating the coexisting disorder. The treatment of OPPOSITIONAL DEFIANT DISORDER may include: Parent Training Programs to help manage the youngster's behavior, Individual Psychotherapy to develop more effective anger management, Family Psychotherapy to improve communication, Cognitive-Behavioral Therapy to assist problem solving and decrease negativity, and Social Skills Training to increase flexibility and improve frustration tolerance. However, below are suggested behavioral and instructional classroom strategies that can be used for kids with OPPOSITIONAL DEFIANT DISORDER. Getting a reaction out of others is the chief hobby of kids with OPPOSITIONAL DEFIANT DISORDER. They like to see you get mad. They try to provoke reactions in people and are often successful in creating power struggles. Therefore it is important to have a plan and try not to show any emotion when reacting to them. If you react too emotionally, you may make big mistakes in dealing with this youngster. Plan in advance what to do when this student engages in certain behaviors and be prepared to follow through calmly. • Always listen to this student. Let him/her talk. Don't interrupt until he/she finishes. • Ask parents what works at home. • Avoid all power struggles with this student. They will get you nowhere. Thus, try to avoid verbal exchanges. State your position clearly and concisely and choose your battles wisely. • Decide which behaviors you are going to ignore. Most kids with OPPOSITIONAL DEFIANT DISORDER are doing too many things you dislike to include all of them in a behavior management plan. Thus, target only a few important behaviors, rather than trying to fix everything. • Do not take the defiance personally. Remember, you are the outlet and not the cause for the defiance- unless you are shouting, arguing or attempting to handle the student with sarcasm. 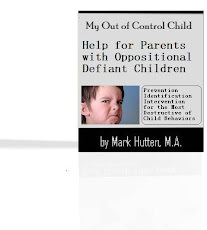 • Establish a rapport with the OPPOSITIONAL DEFIANT DISORDER youngster. If this youngster perceives you as reasonable and fair, you'll be able to work more effectively with him or her. • Give the OPPOSITIONAL DEFIANT DISORDER student some classroom responsibilities. This will help him/her to feel apart of the class and some sense of controlled power. If he/she abuses the situation, the classroom responsibilities can be earned privileges. • In the private conference be caring but honest. Tell the student calmly what it is that is causing problems as far as you are concerned. Be sure you listen as well. In this process, insist upon one rule- that you both be respectful. • Make this student a part of any plan to change behavior. If you don't, you'll become the enemy. • Never raise your voice or argue with this student. Regardless of the situation do not get into a "yes you will" contest. Silence is a better response. • Praise students when they respond positively. • Provide consistency, structure, and clear consequences for the student’s behavior. • When decisions are needed, give two choices or options. State them briefly and clearly. Students with OPPOSITIONAL DEFIANT DISORDER are more likely to complete or perform tasks that they have chosen. This also empowers them to make other decisions. • When you see an OPPOSITIONAL DEFIANT DISORDER youngster getting frustrated or angry, ask if a calming down period would help. But don't force it on him/her. Rather than sending the student down to the office for this cooling down period, it may be better to establish an isolated “calming down” place in the classroom so he/she can more readily re-engaged in classroom activity following the cooling down period. • Allow the OPPOSITIONAL DEFIANT DISORDER student to redo assignments to improve their score or final grade. • Make sure academic work is at the appropriate level. When work is too hard, students become frustrated. When it is too easy, they become bored. Both reactions lead to problems in the classroom. • Minimize downtime and plan transitions carefully. Students with OPPOSITIONAL DEFIANT DISORDER do best when kept busy. • Pace instruction. When the student with OPPOSITIONAL DEFIANT DISORDER completes a designated amount of a non-preferred activity, reinforce his/her cooperation by allowing him/her to do something they prefer or find more enjoyable or less difficult. • Post the daily schedule so the student will know what to expect. • Select materials that encourage student interaction. Students with OPPOSITIONAL DEFIANT DISORDER need to learn to talk to their peers and to adults in an appropriate manner. All cooperative learning activities must be carefully structured, however. • Structure activities so the student with OPPOSITIONAL DEFIANT DISORDER is not always left out or is the last person picked. • Systematically teach social skills, including anger management, conflict resolution and how to be assertive in an appropriate manner. Discuss strategies that the student may use to calm him/ or herself down when they feel their anger escalating. Do this when the student is calm. I appreciate all the helpful tips, and I will try to keep them in the forefront of my mind when dealing with this disorder. I have a second grade student who is giving me lots of trials. My greatest concern and questions are when other students are involved. Sometimes being bullied, sometimes just getting distracted over and over, sometimes their rights or safety are being threatened and I feel I have to intervene. I don't know what to do at times like these when the student with ODD won't listen to me or follow directions. I feel powerless and ineffective as a teacher. I have no authority over this student.